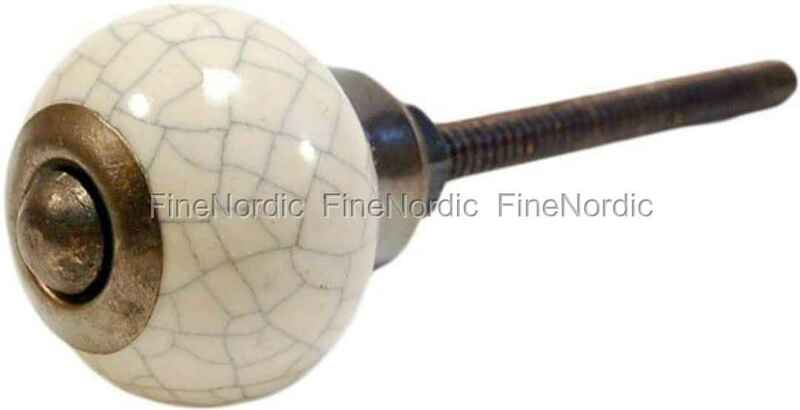 This small porcelain knob in cream has a nostalgic and patinated appearance. The knob has a nice crackled look, which makes it appear old fashioned. It has a diameter of 2.6 cm and once its mounted onto a drawer or door it sticks out 2.8 cm. It is easy to attach by just screwing it in. The knob will add some character to a plain looking piece of furniture. It will look great on a modern chest of drawers as well as a vintage style one. This porcelain knob is only one of the many we offer in our web shop. If you have more than one refurbishing project you want to do, then also have a look at all the other knobs we have available.